​to get the latest updates. Some of our author signing lines will require a wristband to enter. Our festival is a chance for you to see and hear and meet some of your favorite authors, but it's also a chance to discover new authors, both recently published and new-to-you authors, and a chance to find new books to love. Please understand that, while we do our best to let you hear and see as many authors as possible, you might not win a wristband to see one of the authors whose lines are limited-entry. Take the opportunity to hear them speak on panels, take their pictures, and hear other authors whose books intrigue you. Please read the wristband details carefully before coming to the event so you will understand the procedure. TeenBookCon relies on donations in order to offer free admission. Will you help us promote literacy and lifelong reading? All donations help and are tax deductible. Please see our Sponsors page for more information. Click "Donate" for credit card donations. 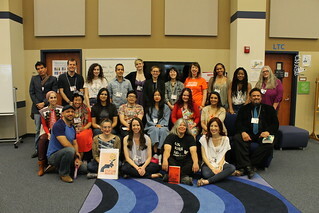 Teen Book Con is organized exclusively for charitable, educational purposes under section 501(c)(3) of the Internal Revenue Code, or corresponding section of any future federal tax code.